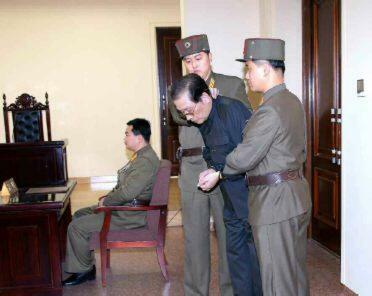 Jang Song Thaek was accused of gambling, using drugs, womanizing, and corruption. "Worse than a dog," according to Korea Central News Agency. North Korea has executed Jang Song Thaek, the uncle of leader Kim Jong Un, as "a traitor to the nation," "worse than a dog," according to the state-run Korea Central News Agency. Jang Song Thaek, frequently described as Kim Jong Un's right hand, was recently expelled from his party and stripped of power, facing allegations of "corruption, drug use, gambling, womanizing and leading a 'dissolute and depraved life,'" the Associated Press reported Friday. Before his execution, a government tribunal found him guilty of "attempting to overthrow the state by all sorts of intrigues and despicable methods with a wild ambition to grab the supreme power of our party and state," according to KCNA. "Jang pretended to uphold the party and leader but was engrossed in such factional acts (such) as dreaming different dreams and involving himself in double-dealing behind the scene." Last week, Reuters reported that an aide who managed funds for Jang fled Pyongyang to seek asylum in South Korea — the first major political defection in years. A still image taken from North Korea's state-run KRT television footage shows Jang Song Thaek being forcibly removed from a meeting of the Political Bureau of the Central Committee of the Workers' Party of Korea (WPK) in Pyongyang.